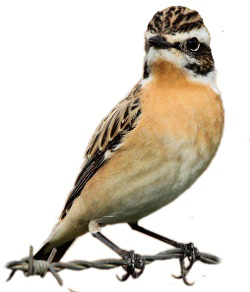 The male Whinchat in spring has a pale yellowish underside, orange-buff breast, black streaked head and cheeks and a bold white stripe above the eye. A summer visitor to most of Europe. In the UK it is becoming increasingly scarce and can be found only in localised areas. It is considered to have an amber status, however in Europe it is more common. It winters in Africa. A bird of open grassland, moorland and heathland. 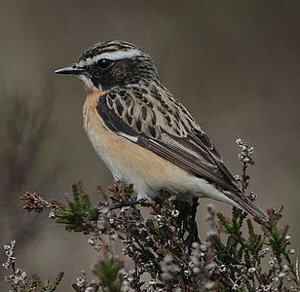 Unlike it's close relation the Stonechat, the Whinchat is much less common and has declined at an incredible rate within the UK. This is thought primarily to be due to the decreasing amounts of wild un-cultivated grassland. This image shows the distinctive white eye stripe, mottled back and orange-buff breast. The bird is in typical posture on top of small stands of heather or bracken from which it calls or catches insects in flight. 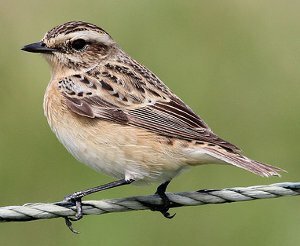 The female Whinchat and a male in winter are very similar, much paler than the male in spring, the breast is less orange and the back and head is much browner. The female still has the bold eye stripe of the male and the white wing and tail markings. 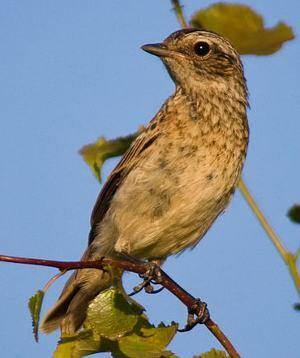 The juvenile bird has a less pronounced eye stripe which is more buff than white. The breast has light speckling and the underside can have a slight yellow tinge which is just visible in this image.